You’ll need to secure funding, get credentials, choose a legal structure and get licensed before launching a medical practice. Fresh out of her residency at Albany Medical Center, Dr. Dana Cohen got a job working for one of the most recognized doctors in America: Robert Atkins, of the Atkins diet. But a few years into the job, Cohen decided that working for someone else — even a famous doctor — wasn’t for her. In 2002, the physician quit and started her own medical practice out of a New York City brownstone. “At the time, I was so young and so naive and really had no idea what I was doing,” Cohen tells NerdWallet. It takes years of training to become a doctor, but that might not fully prepare medical practitioners for the career path some choose: starting their own practice. It’s a daunting process, and there are a number of professionals to consult — health care attorneys, accountants, medical practice consultants. In addition, it will take some sort of financing. NerdWallet has come up with a list of small-business loans to meet owners’ needs and goals. We gauged lender trustworthiness and user experience, among other factors, and arranged them by categories that include your revenue and how long you’ve been in business, so that you know which loans you qualify for. Fewer doctors are starting one- and two-person practices, largely because it’s expensive to start up. It’s also difficult to deal with insurance companies and changes in health care legislation, says Franklin Walker, director of rural health initiatives at the North Carolina Medical Society Foundation. He also runs PractEssentials, the group’s consultancy. Doctors who do decide to pave their own path face the challenges Walker cites and more. Dr. Linda Delo, an osteopathic family physician in Port St. Lucie, Florida, has struggled to bridge the cash flow gap between when she treats her patients and when the insurance companies reimburse her for the care. It’s also a challenge to get patients to pay her directly. To increase her chances of getting paid on time, Delo’s staff collects patients’ insurance information and calls insurers to verify coverage before appointments. She also talks to patients about how insurance works so they understand what they’ll be expected to pay. When launching any small business, you need a business plan, funding and legal counsel, and you’ll need to be in compliance with federal and state regulations. Here are some things to think about as you get started. Medical practitioners, like many small-business owners, often need a small-business loan or other outside capital to help cover startup costs. If you’re already saddled with medical school debt, it can be daunting to ask for more financing. But even with her student debt, Cohen got a loan backed by the U.S. Small Business Administration. Consider your startup costs to help pinpoint how much you’ll need to borrow: real estate, construction, equipment, and attorney, accountant and consultant fees. Consider your startup costs to help pinpoint how much you’ll need to borrow: real estate, construction, equipment, and attorney, accountant and consultant fees. Other expenses include computers, medical records software, office furniture and disposable supplies such as gloves, gauze and bandages. These items can add up, but you can save money if you don’t start from scratch, Walker says. “Oftentimes, it’s less expensive to buy into a practice that’s expanding or take over for a retiring doctor,” he says. Ultimately, Cohen’s first practice failed because she wasn’t bringing in enough patients to pay her expensive New York City rent. She opened her current practice in 2009, in a commercial space she shares with another physician to save on rent. This time, she took creative measures to cut costs. “There were times when I had a massage therapist share the space on weekends and evenings,” she says. 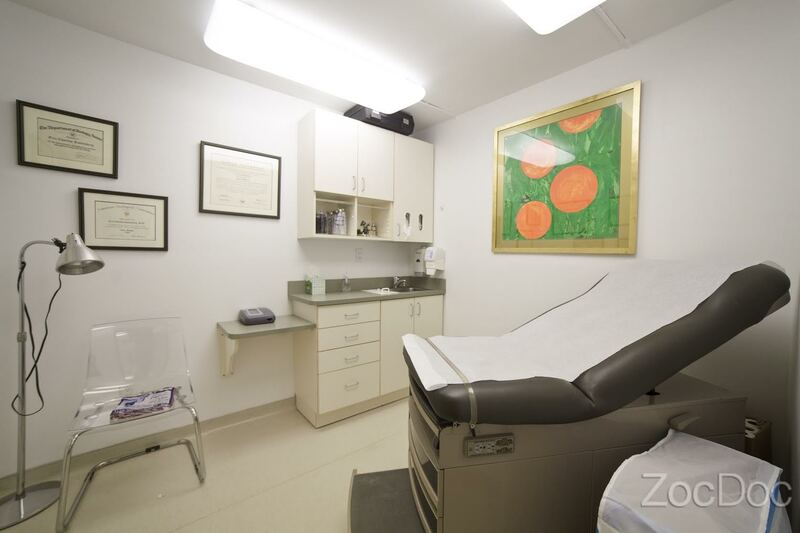 Dr. Dana Cohen’s medical office in New York. Photo via ZocDoc. You’ll need to go through a process known as “credentialing” to accept government or private health insurance from patients. The entire credentialing process can take several months. Insurers will typically ask about your medical education and residency, and they’ll want to see that you’re properly licensed and have malpractice insurance. Not all states require malpractice insurance, which varies based on your specialty and location. But having it will help protect your personal assets in case a patient sues you. Check with your state department of insurance for more information. Your branch of medicine and your area’s demographics help inform what public health insurance programs you should consider. Your branch of medicine and your area’s demographics help inform what public health insurance programs you should consider. For example, if you’re a geriatric physician, you’ll want to sign up with Medicare. If you practice in a low-income area, you might consider participating in Medicaid. You can enroll for Medicare on the Centers for Medicare and Medicaid Services website and sign up for Medicaid with your state. Walker recommends researching the popular private insurance providers in your state. Although Medicare and Medicaid reimburse all physicians equally for providing the same procedures, you can negotiate reimbursements with private insurance providers such as Blue Cross Blue Shield, Aetna and UnitedHealth. “You need to decide [which insurers] to participate with and negotiate a contract with each one individually,” says Margo Williams, a senior associate at the American College of Physicians, the national group representing the internal medicine specialty. As a small-business owner, you’ll need to choose a legal business structure, which will determine how you pay taxes and to what extent you’re personally liable for lawsuits, debt and losses. Walker says most practitioners he works with form S corporations, where they only pay taxes on their personal income from the business. This is different from a C corporation, where businesses are taxed at the entity level and on their personal income from the business. It’s worth hiring a health care attorney to advise you on this decision and draft the legal documents — articles of incorporation, articles of organization or a partnership agreement — needed for the structure you choose. NerdWallet has rounded up online legal services that offer money-saving DIY options and lower-cost access to attorneys. After choosing your legal structure, you’ll need to apply for an employer identification number, or EIN, on the Internal Revenue Service website. This number identifies your business to the federal government for taxes. You’ll also need to register for state and local taxes; find information about each state’s tax registration process on the SBA website. State licensing: You need to get licensed by the medical board in your state. The Federation of State Medical Boards’ website has a list of links to each state’s board. National provider identifier: All medical providers need a national provider identifier number, which you can apply for on the National Plan and Provider Enumeration System website. Medicare, Medicaid and private insurance companies use this number to keep track of health providers. DEA registration: To prescribe medication, you’ll need a DEA number issued by the U.S. Drug Enforcement Administration. You can apply online at the DEA website. Additional regulations: There are other specific rules depending on the type of medicine you practice and the procedures you provide. For example, if you have an in-office laboratory, you need certification by the Clinical Laboratories Improvement Amendment program through the U.S. Centers for Medicare and Medicaid Services. If you have X-ray equipment, you have to register with your state, typically through the health department. The Medical Group Management Association, the national organization that represents health care administrators, has a detailed checklist for starting a medical practice. The group also has affiliate chapters in each state. Physicians can join the American Medical Association, the industry’s national organization, to get information about legal issues, medical ethics and practice management. Each state has a medical group that can provide state-specific information. The Accreditation Council for Continuing Medical Education has a list of state medical societies and associations. Teddy Nykiel is a staff writer covering personal finance for NerdWallet. Follow her on Twitter @teddynykiel and on Google+. Contact her at teddy@nerdwallet.com.